UPDATE 3 (25 May 2012): Marc Hendrickx over at the ABC News Watch blog has picked up the baton, and is drilling down into what precisely happened at the ABC in relation to this story. See his posts here and here. Great work, Marc. UPDATE 2 (24 May 2012): Legal editor at The Australian, Chris Merritt, writes a lengthy piece on the FOI/ABC/MW spat here. UPDATE: Andrew Bolt tears Media Watch to shreds here. 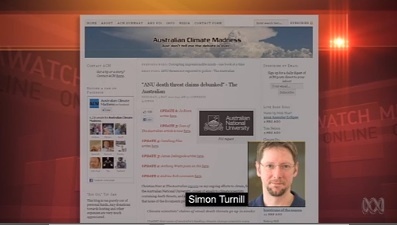 ABC’s Media Watch reported on the ANU FOI story last night (see here for background). They criticised the ABC for not properly correcting or clarifying their original story of 4 June 2011, but reserved their harshest words for The Australian, whose reporting of the story they construed as attempting to debunk ALL alleged “death threats”, whether at ANU or elsewhere. This was obviously not the case, as the FOI only related to ANU. [Media Watch host Jonathan] Holmes gave the impression that the newspaper’s reports debunking death threats at the ANU had extended to other alleged death threats at other universities. The Australian’s reporting of the issue has focused on tracking the progress of Mr Turnill’s FOI request, which focused only on ANU. Holmes also mistakenly asserted that The Canberra Times had not reported there had been death threats at ANU. But articles to the contrary were published by that newspaper on June 4 and 5 last year. Alan Sunderland, head of policy at ABC news, said the update provided further information “in the light of the controversy over elements of the details, and the contested views put forward about aspects of the story”. The story is up at the Media Watch web site here. They proudly displayed some emails that a couple of anonymous climate scientists had supplied, and, yes, they contain unpleasant abuse and foul language, but crucially, no death threats. I realise that many people are missing the subtle distinction here between abuse and death threats. Whereas anyone in the public glare, such as politicians and celebrities, will receive their fair share of abuse and obscenities (the kind shown on MW last night, and on their web site here – PDF – warning, extremely strong language) from a small and disturbed section of the population, death threats are a serious criminal offence carrying very severe penalties. By conflating the two issues in a single story and thereby muddying the waters, is highly misleading journalism. By the way, Holmes also claimed last night that these “threats” were reported to the police. But the police wouldn’t have been interested. They’re not threats, they’re “mere” abuse. Another non-point. Why did the Canberra Times choose to run the story it did? Who is helped by it and who is harmed? Allegations of death threats are an extremely serious charge. Rosslyn Beeby’s story, written as it was by a fervent believer in the cause of man-made global warming, discredited and smeared sceptics, whether intentionally or otherwise, by suggesting that they would stoop to criminal actions such as issuing death threats in order to stifle debate on climate change. And in turn, the climate scientists are portrayed as innocent victims in all of this, garnering sympathy at a a time when their credibility and the public’s trust in their doom-laden pronouncements was (and is still) at an all time low. Like climate scientists, environmental journalists are a self-selecting set of environmental activists, so it is hardly surprising that Beeby takes the line she does. But still for there to have been produced no evidence of a single actual, genuine, death threat, after three weeks of fairly intense media scrutiny, is concerning. If there are such threats, then let us see them, and please explain why they were not reported to the proper authorities, rather than being leaked to the media. It goes without saying (but I will say it anyway), that abuse and obscenities of the kind sent to climate scientists is deplorable and they should not have to put up with such behaviour in a civilised debate. However it cuts both ways. Given the vitriolic manner in which those who disagree with the orthodoxy on climate change are regarded (for example by being compared to Holocaust deniers, or regarded as criminals against humanity who should be executed, or who should be tattooed, or worse, gassed), it is unfortunately not entirely surprising that a tiny minority of those resort to the kind of abuse we have seen levelled against the climate consensus. Further FOI requests are in place. I anticipate this story will disappear from the media until the results of those requests are known. POSTSCRIPT: Desperate to keep the death threat risk real so he can continue to use it to smear anyone who disagrees with his precious consensus, Deltoid (link in the Headbangers blog roll) still can’t tell the difference between a death threat and mere abuse. Waving a noose in front of someone isn’t very nice, but it ISN’T A DEATH THREAT. If it was, then why wasn’t the person involved arrested and charged? And silence on the actual issues in question above, naturally. There is an offence under S474.17 of the Criminal Code for harassing phone calls. But that is all. It’s harassment. And generally, and worth noting, is that no action would be taken in a one off instance of texting abuse or harassment. This is because it’s a well known fact that people sometimes get overly emotional and “hot under the collar” and will text out abuse before their brains are fully engaged. The offence is found in s 474.17 of the Code. I can’t find any reference or requirement about the necessity of informing the Canberra Times.! Good point about distinguishing between abuse and death threats. Strange that abuse and threats are linked in the same breath by so many when they are so different. Little wonder these morons are so confused about Climate “Science”. They can’t even identify a death threat.. This entire fiasco is yet more evidence (as if any more were needed) that the the entire CAGW cultist scam is populated by a hive of inveterate liars and delusional types. These thoroughly troubled individuals are a veritable scientific phenomenon. I would encourage them to will their brains be preserved for thebenefit of neurological research. They must be wired very differently. Possibly a new sub-species: ‘Warmista neuroticus’? But what could be the adaptive significance of being ont he one hand extremely gullible/ delusional while simultaneously a pathological liar? The CAGW cultists make me larf though. Dare I say it: give ’em enough rope and they will hang themselves. At least it saves anyone else having to bother!! So waving a noose in front of someone is not a death threat……hmmmm. telling someone presenting a scientific explanation that is counter to your unscientific and highly emotional/irrational beliefs that have a shooters license and will come back later (one of the charming efforts that had those at ANU worried)? ‘Give ’em enough rope – and they will hang themselves’ is a saying. The first part was even the title of chat show in Australia for some years… It is not to be taken literally. You’re not very bright, are you ‘sustainable future’? Perhaps you’re not getting enough calories…? I worked as an Environmental Health Officer and enforced the Qld Environmental Protection Act. I was required to travel to workplaces and licence tradesmen who had never been required to be licenced in environmental matters. The fees were set by the State and were significant. The vast majority of the people I dealt with were courteous – even those who felt this was unreasonable intrusion. A few, however, uttered insults and actual threats – some worse than what I have read on Media watch’s site. The big difference is however – I had to face these in person on my own and, further, had to return to require those who ignored the licence demand comply with the law and, even further, collect evidence to use in court actions. Had I and others been as pathetic as some of these clowns there would be oil waste still flowing down creeks and spray paint contaminating the lungs of third parties and employees alike. Imagine what the police cop daily – although my situation was worse – I was alone and unarmed. I condemn threats but some stupid words written in passion into an email are not credible “death threats” – they are cowardly expressions of frustration. Stop trying to snow us.